A Scottish Jewish group has called for peaceful “civil disobedience” to prevent pro-Israel organisations from joining a major anti-racism protest in Glasgow next month. Scottish Jews Against Zionism (SJAZ) is opposed to the Confederation of Friends of Israel Scotland (COFIS) participating in the Stand Up To Racism (SUTR) event in Glasgow, which is planned for 16 March 2019. The protest is being organised by a coalition of civic organisations, trade unions and political organisations in advance of United Nations International Day for the Elimination of Racial Discrimination on 21 March. Similar protests are being planned around the world. The event is being held to oppose the “rising tide of racism, islamophobia, antisemitism and the scapegoating of refugees and migrants”. But there is pressure on the organisers of the demonstration to ban pro-Israel groups from taking part. SJAZ has posted a statement on its website demanding that groups promoting racist ideas should be excluded from the protest. “The Israeli state, in its founding principles, and now strengthened by the 2018 Nation State law, explicitly prioritises Jewish people within Israel, whilst committing human rights atrocities and massacres in the Palestinian territories that it occupies,” SJAZ said. The statement continued: “We are not seeking to ban individuals. 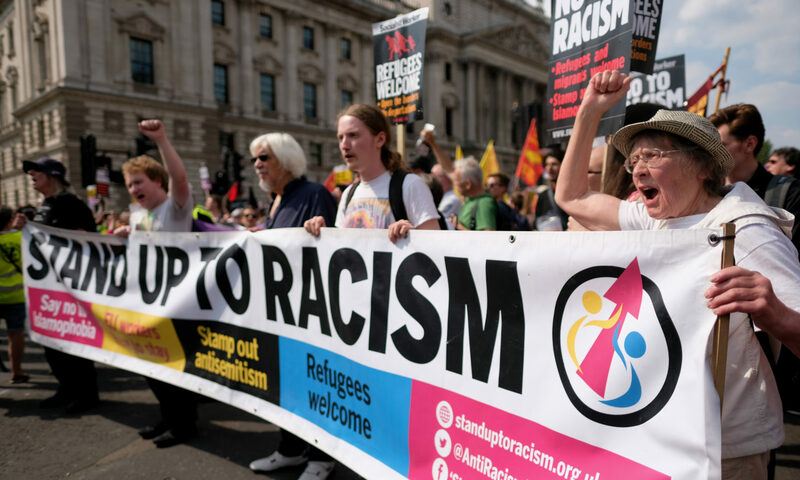 We call for the exclusion from an anti-racist march of an organisation that promotes racist ideas, and that uses its acceptance by SUTR as validation of its position. SJAZ’s opposition to pro-Israel groups was backed by Mick Napier of Scottish Palestine Solidarity Campaign. The prospect of COFIS marching on 16 March “horrifies and repels a large chunk of active anti-racists in Scotland and weakens the challenge to the rise of the far right, for many of whom Israel is an inspiration,” he said. COFIS, however, denied that it supported racism. It said that it had reported SJAZ to Police Scotland for calling for civil disobedience to prevent the group’s members from joining the protest. Edward Sutherland from COFIS said that the organisation existed to challenge antisemitism in Scotland and to “promote peace” between Israel and Palestinians. He argued that groups around Scotland were “united in hating Israel”, claiming that last year’s SUTR march was “disrupted by masked thugs”. “We are appalled, and have reported to Police Scotland, SJAZ’s incitement of civil disobedience to prevent us marching against antisemitism and other forms of racism on 16 March,” Sutherland said. He added: “Israel is a legitimate sovereign state, whether it suits SJAZ or not, and Jews have the same right to self-determination as any other people. “Israel provides social and political freedom unique in the region, and surveys consistently show that, while most of Israeli Arabs support the creation of a Palestinian state, the majority would prefer not to live in it. Jews would not have this choice, since the Palestinian Authority imposes savage punishment on any Arab who sells land to a Jew. Sammy Stein, chair of Glasgow Friends of Israel (GFI), said that for years his organisation had advocated for a “secure and lasting peace for both the Israeli and Palestinian people while strongly opposing all form of racism, especially antisemitism”. He added that GFI looked forward to “marching shoulder to shoulder with members of SUTR next month”, claiming that SJAZ was a fringe group “opposed by 99.5 per cent of Scotland’s Jewish community”. “Charges of apartheid are totally baseless in a country where Israeli Arabs practise law in the highest courts, voluntarily join the Israeli army and where the third largest political party in the Israeli Parliament is an Arab party,” Stein said. Stand Up to Racism Scotland said it does not take a position on the Middle East, adding it does not have any formal relationship with COFIS. It also urged people to attend next month’s event, citing the rise of the far right across the UK. “The presence of Stephen Yaxley-Lennon aka “Tommy Robinson” in Scotland recently is alarming. The far right is feeding off an atmosphere of scapegoating of refugee and migrants. This has been exacerbated by a toxic debate around Brexit and immigration. Unity is our most important weapon,” said SUTR. “The key criteria are opposition to the rising tide of racism, islamophobia, antisemitism and the scapegoating of refugees and migrants. If you support these principles please join us #noracismnofascism”. The Ferret reported in January that both COFIS and GFI issued statements disassociating themselves from a former member of the far right British National Party who was filmed apparently helping out at a GFI stall in Glasgow. Photo thanks to Alisdare Hickson | CC BY-SA 2.0 | Wikimedia Commons. I wonder whether it would be worth changing the narrative from ‘pro-Israel’ to ‘pro-Apartheid’ ‘pro-Supremacist’ ‘pro-Occupation’ ‘pro-Segregation’ or pro-Ethnic Cleansing’ to list but a handful..?